Apple's restoration of Washington D.C.'s Carnegie Library as part of its conversion into a massive retail outlet for the iPhone maker could open to the public soon, after the building owner advised current expectations is for it to be completed in late spring. The work to turn the historic Carnegie Library into an Apple Store will be finishing soon, a query from the D.C. Council reveals. The building's owner, Events D.C. confirmed the construction plans were nearing completion, and could be open as soon as this April. The store "is scheduled to open in late spring 2019 after completion and the required startup sequencing" said Events D.C., according to the Washington Business Journal. Plans to open an Apple Store at the library surfaced in 2016, with Apple's proposals for the location revealed as part of a plan to the Advisory Neighborhood Commission in 2017. As part of the conversion, the library's book collection is being relocated elsewhere, with reading rooms turned into product demonstration areas and the main space holding Apple's "Genius Grove." 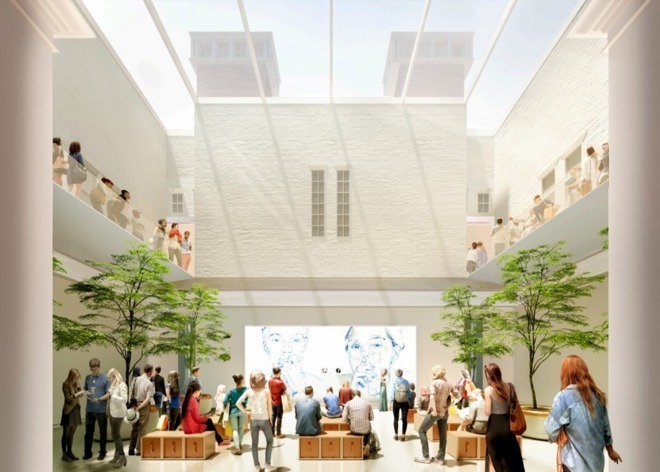 While the recent announcement of Angela Ahrendts exiting the position of senior vice president for retail may affect some Apple Store plans, it is unlikely to make an impact into what is being carried out at Carnegie Library. The "Town Square" motif of a video screen and a grove of live trees is still expected to be included in the store's design. The floor space leased by Apple was previously reported to be approximately 63,000 square feet, but the latest report advises the store footprint will be around 19,000 square feet. It is also believed Apple will be paying market rent and a sum of between $1 million and $2 million to Events D.C. to cover losses relating to the Apple Store being in the space versus its prior usage. It is also believed Apple is renting the space on a 10-year lease, with two optional five-year extensions.